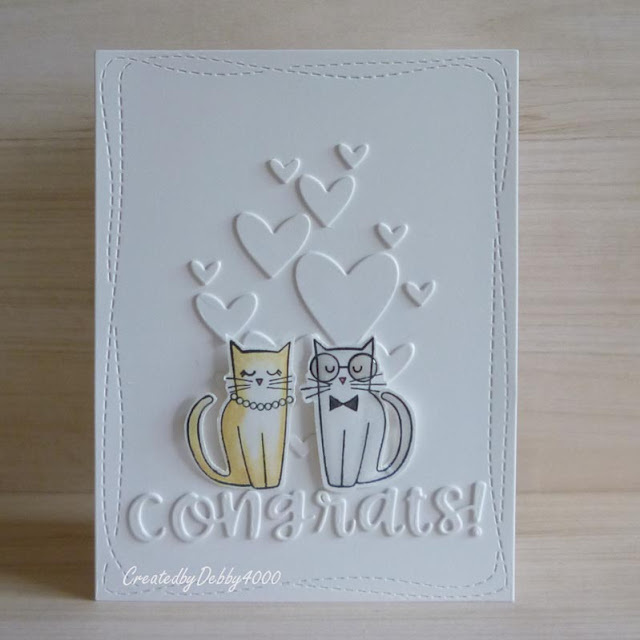 Let the huge Stamptember Party begin and I'm using some more cards with Right Meow, I love this kitty couple. I lightly coloured the kittys and fussy cut with a border but there are dies available too. First of all I used the Wonky Rectangles to give my CAS finished look. 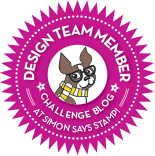 I then used the Clipping Heart die using the actual hearts and not the outline. I actually die cut it twice to layer my hearts to give a bit of definition on white card and I did this with the congrats die too. It was then the case of using some foam squares for placing my kittys although I glued down their feet. Nearly forgot I used some glossy accents for the kitty's glasses and a uni-ball signo white pen for the pearls. Apologies for the crooked photo I can assure it is a proper rectangle, first of all my kittys were made exactly as the pair above. This time though I used the sentiment from Congratulations stamp set and this is where a heart was left over that I used on yesterday's card using the Holiday Shapes dies. Mat and layered with matching pink card. Unfortunately my craft money didn't stretch to the kitty dies but they definitely on my wish list those kittys tails were very tricky to fussy cut. 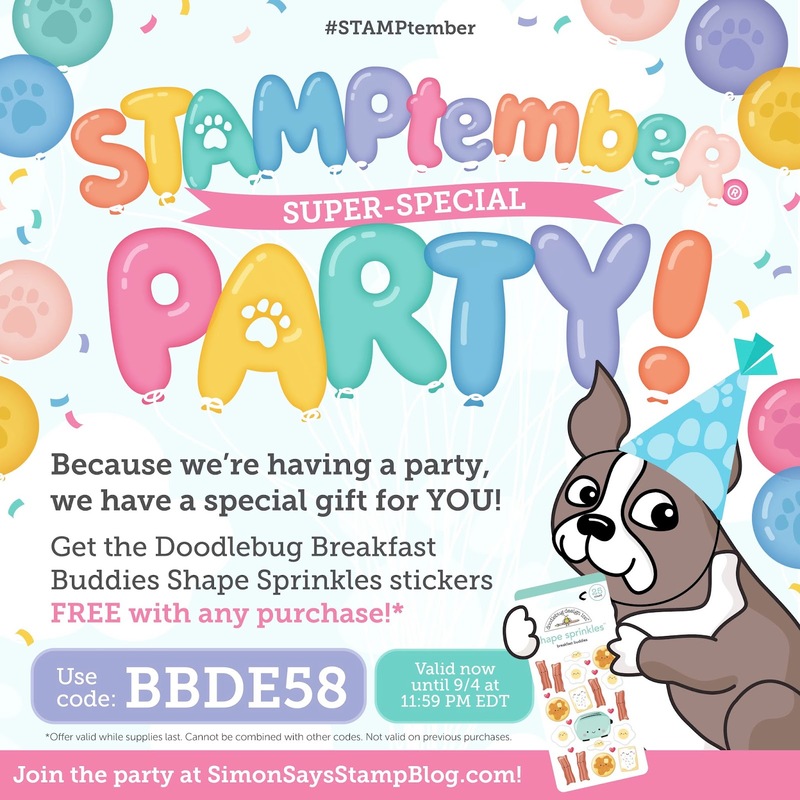 I have a little treat here just use the code below. Love these cards! Thank you for sharing! Such a great card. So creative! Cute cards. Love the style of your cards!! I love these! They are exactly my style! I am so in love with the cats! Love these cards, especially that first one! these little kitties are just adorable. These cards put a smile on my face. The doubling of the is outstanding idea. CAS which I really like & such a different idea for giving for a wedding card. Love them! I love cats and I LOVE your CAS cards. I will need to get that set, for sure! Two precious kitty cards!! Love your sweet work Debby! 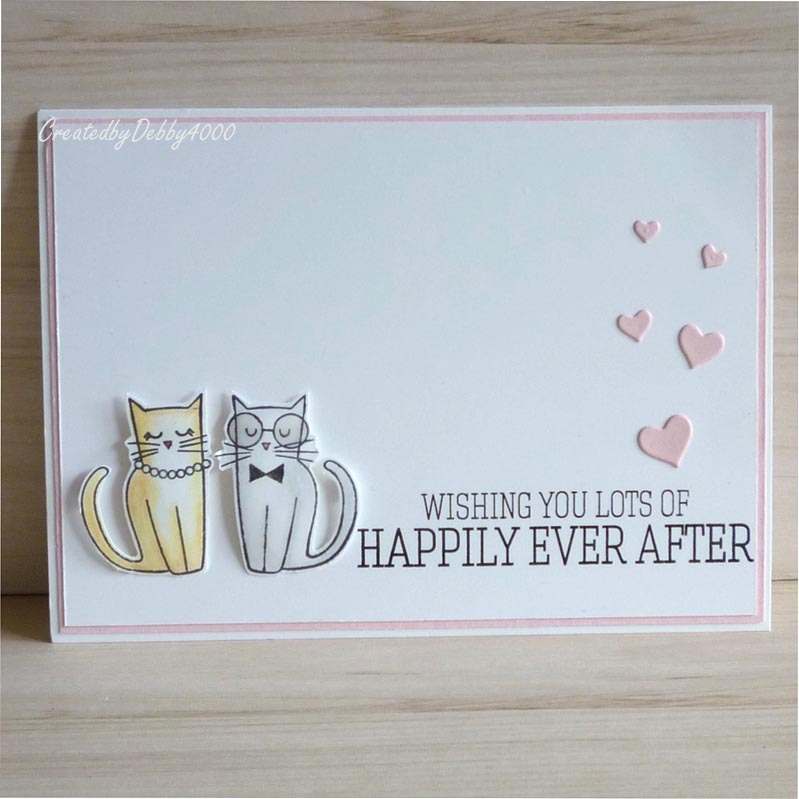 Gorgeous couple card. Love the look of those cats. Great heart background as well. Great idea.